Looking to escape to the beach this summer? Well, before you book that trip to Cape Cod or the Outer Banks of North Carolina, you might want to consider an unorthodox option — the shores of Lake Superior. The lake, which is the northernmost, coldest, and deepest of the five Great Lakes, is the warmest it has been at this time of year in at least a century, thanks to the mild winter, warm spring, and hot, dry summer. A comparison between Lake Superior's average water temperature this year so far and the longer-term average. Click on the image for a larger version. Credit: GLERL. OK, so the lake’s average water temperature is still a bracing 68 degrees, but it's considered downright tropical for the region. As the above chart shows, based on the 30-year average, the lake’s average water temperature should be in the mid-50s. But thanks to scant lake ice cover this past winter, along with a rare March heat wave and warmer-than-average weather since then, the lake began warming earlier than normal, and that warming has kept right on going. Wintertime ice cover on the Great Lakes was the lowest observed since such records began in 1980. “It’s pretty safe to say that what we’re seeing here is the warmest that we’ve seen in Lake Superior in a century, ” said Jay Austin, a professor at the University of Minnesota at Duluth, who has researched the lake’s water temperatures back to the beginning of the 20th century. The lake's record temperatures are yet another consequence of the record heat so far in 2012. The contiguous U.S. had its warmest January-to-June period since records began in the late 19th century. Manmade global warming will likely result in more years with very warm water temperatures, which could have significant adverse consequences for marine life. In a rare benefit from the ongoing drought, this summer has been so dry that the warm water temperatures are not resulting in major harmful algal blooms, such as one that occurred on Lake Erie last year. Instrument data from three buoys in Lake Superior provide a reliable record of water temperatures since about 1980, and the information also shows that, with water temperatures running in the mid-to-upper 60s (and even warmer closer to shore), “we are at record temperatures for this time of year, ” according to Austin. Because of sand and other particles within in the runoff, sunlight is not penetrating far below the surface, and that helps heat near-surface waters more significantly than if clearer waters were present, Austin said. 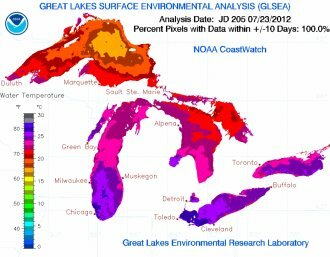 Satellite-generated temperature analysis of the Great Lakes. Click on the image for a larger version. Credit: GLERL. 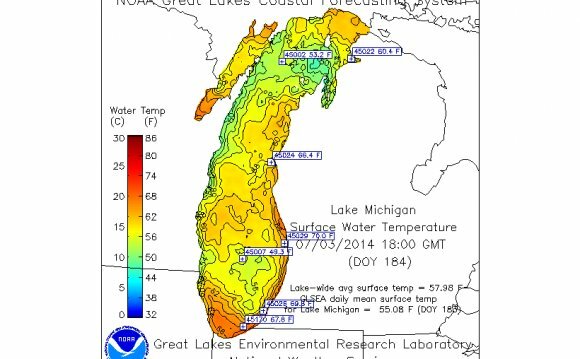 Data shows a long-term warming trend throughout the Great Lakes, which may be related to manmade climate change. According to George Leskevich, a physical research scientist with the Great Lakes Environmental Research Laboratory in Ann Arbor, Mich., there is also a long-term downward trend in Great Lakes wintertime ice cover, although there is considerable year-to-year variability. The all-time daily average high temperature record for Lake Superior is 71°F, which was recorded in mid-August 2010. With a few more weeks of warming left, that record is in jeopardy. “The season hasn’t played itself out yet and we’re already within 3 degrees of the all-time daily record surface temperature, ” Austin said. Leshkevich said that low wintertime ice cover, combined with the record warmth during March, helped jump-start the warm season, particularly in the western Great Lakes. The eastern Great Lakes, such as Lake Erie and Lake Ontario, have also been running at or above temperatures seen during the past six years, but they are not at such unprecedented levels, according to GLERL data. Lake Erie is the shallowest of the Great Lakes, and therefore it is typically the first to warm up during the spring. Lake Superior had much below average ice cover during the 2011-12 winter, as this chart shows. Click on the image for a larger version. Credit: GLERL. “You probably got a running start to the heating season and it’s been so warm here, certainly in the Midwest and Great Lakes area, I think it’s just kept going, ” Leshkevich said. For example, the South Buoy on Lake Michigan, located 43 nautical miles southeast of Milwaukee, recorded a water temperature of 80°F on Friday July 6, a feat the National Weather Service (NWS) said was “remarkable . . . for the lake to begin with . . . But unprecedented for this early in the summer season.” The previous date of the earliest 80°F temperature was July 21, which was set during both 2010 and 2011. The average water temperature for July 6 at the South Buoy is a chilly 63°F. The rapid temperature increase on Lake Michigan was closely tied to the heat waves that have affected the Midwest this summer. Chicago has experienced its warmest year to date, and the early July heat wave in the Windy City that sent temperatures soaring into the triple digits caused water temperatures at the South Buoy to climb by 10°F during the course of just one week, the NWS said.